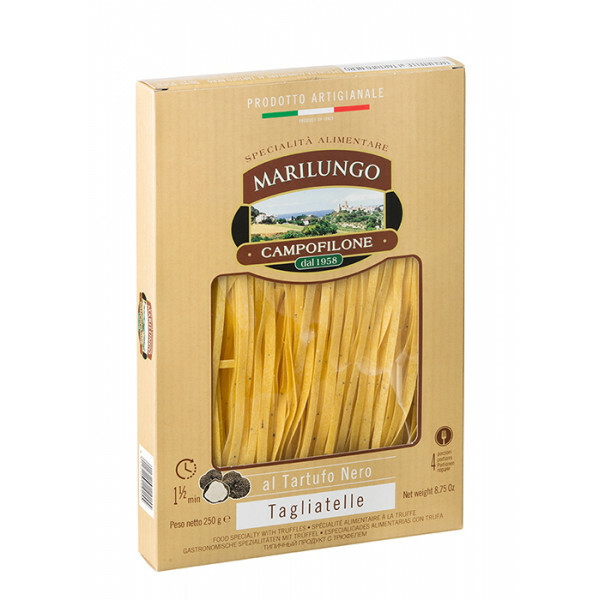 These tagliatelle are prepared with exceptional artisanal care and dried at low temperature. Only premium quality durum wheat and free-range farm eggs both exclusively sourced from Marche, Umbria and Tuscany, are used.Their natural versatility makes them delicious with all types of condiments. They are excellent for first courses, perfect with fish sauces, or with butter and white sauces made from soft cheeses and cream. Durum whaet semolina, fresh pasteurised eggs (37%), black truffle (tuber aestivum vitt), 2% Flavourings. This products contains allergens.